Experience overwhelming sonics on this Decca Hybrid Stereo SACD. Mahler Symphony No. 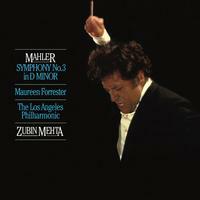 3 by the Los Angeles Philharmonic Orchestra conducted by Zubin Mehta with Maureen Forrester, contralto. Considered to be one of the best Decca recordings; made in March 1978 in Royce Hall, U.S.A. by recording engineers James Lock and Simon Eadon. Mastered by noted mastering engineer Willem Makkee from the original tapes.